B.C. Campus Open Education: Open Textbook Self-Publishing Guide is a practical reference/development tool for individuals or groups wanting to write and publish an open textbook. 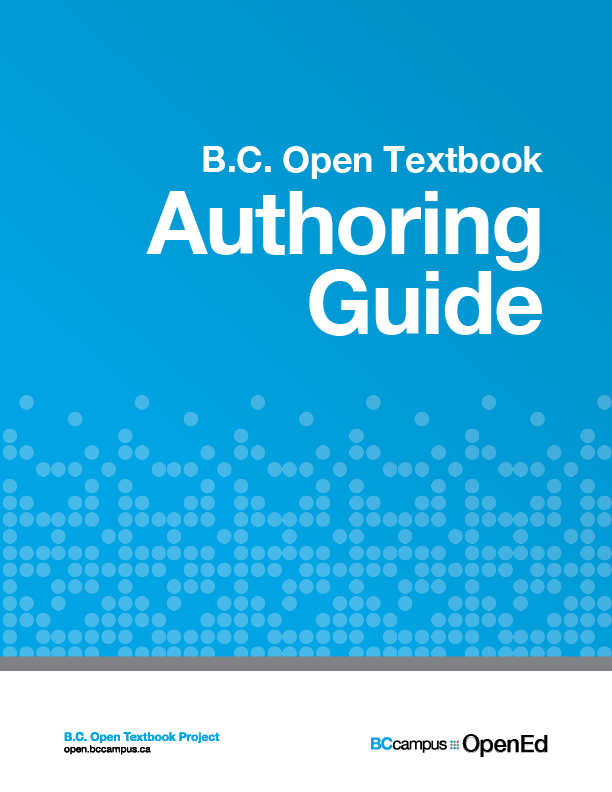 This guide provides details on the preparation, planning, writing, and publication of an open textbook as well as the importance of editing and proofreading, Copyright, open copyright licenses, and the differences between citation and attribution are discussed. The Self-Publishing Guide by Lauri Aesoph is licenced under a CC-BY 4.0 International Licence, except where otherwise noted. Lauri M. Aesoph, B.C. Campus: Victoria, B.C. You just viewed B.C. Campus Open Education: Open.... Please take a moment to rate this material. If you know the author of B.C. Campus Open Education: Open Textbook Self-Publishing Guide, please help us out by filling out the form below and clicking Send.